Crocodile Nest B&B - Nelspruit Accommodation. 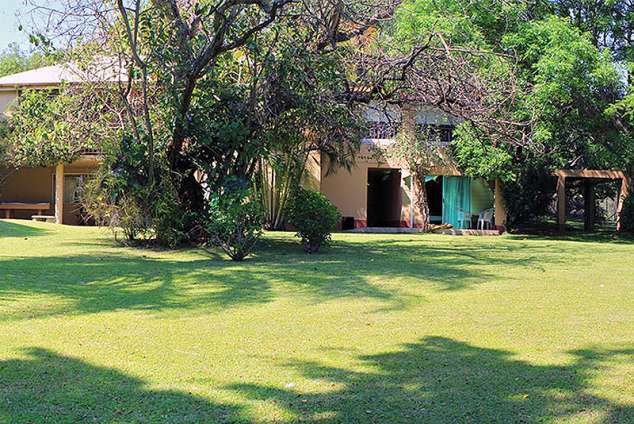 Crocodile Nest B&B is located on a Citrus-exporting farm situated in the productive Crocodile River valley, a few minutes from the Nelspruit CBD, and directly on the N4 highway from Johannesburg to Nelspruit. The accommodation takes the form of five log cabins, of which 4 are simple two- person sleeping cabins with ensuite bathroom, and access to a communal living-room. A braai and entertainment area is situated there and available for use. The fifth cabin is a snug family unit, capable of sleeping 4 people. Further to the above, are 3 ensuite bedrooms, each with own tv, tea/coffee facilities, bar fridge and microwave. The large family room additionally, has a microwave. Our rooms are smoke-free, with plenty of garden space for those who smoke. Crocodile Nest is securely electric-fenced, with a security service back-up and plenty of parking space for those with bike trailers, boats etc. Guests are welcome to use the swimming pool and braai facilities. Please bring own swimming towels. Our garden is a bird haven throughout the year. Pleasant scenic walks can be enjoyed within the citrus orchards, and with prior arrangement, guests may be able to climb the high Pimlico granite kopje adjacent to the farm. We lie within easy range of the Kruger Park, Sudwala Caves, the Panoramic Route, Mocambique border and its Capital, Maputo. Within Nelspruit lie the beautiful Botanical Gardens, excellent medical facilities and good shopping as well as many very good restaurants. Local day tours of various options including the Kruger Park, Panoramic route with Blyde River Canyon, Endangered Wildlife and Rehabilitation centre and Cheetah breeding project, etc, can be arranged with collection and drop off at Croc Nest. The Jane Goodall Chimpanzee Eden is located between Nelspruit and Barberton, which is famous for its prehistoric geological formations, the Barberton Daisy and Gold mining history, and is an easy one hour drive. Detail description : Guests are welcome to walk/run/mountain cycle on the farm. 36337 page views since 27 Nov, 2007. Last updated on 23 Nov, 2018.